I used to have a certain view of Starbucks. As a non-coffee drinker I didn't frequent their shops so it was formed by other people's representation of them and I wasn't really interested in forming my own. I had good friends that worked there and I certainly wasn't anti-Starbucks but generally I thought it was just another big chain taking over the world. I had no idea what values they were trying to implement in their stores but Rob Hensser (our base director), Boris and Derek knew alot more about it than I did. Aside from being coffee connoisseurs they've read the Starbucks story and knew that Starbucks value community and want to be a force for positive action in their neighbourhoods. And so they have been meeting with the big wigs from Starbucks Mooloolaba and it turns out that they are Christians and have been looking for ways to get involved locally outside their stores. Thus begins a beautiful partnership. Starbucks usually works with registered charities which we are not but they really grasp the concept of business as missions and want to support what we do. Huzzah for Starbucks! One of the guys goes on to call us "biblestore." It's uncomfortable to be hated but whatever you're doing you're going to get hated on and I'm stoked that of all things, they're hating on us for giving away free bibles. They got the church funded and SBA backstabbing bit wrong but it's pretty rad that people know us for being about Jesus and they're even putting it out there for us. Biblestore. Cool. Regardless of the negativity Friday night was busy and people were loving the free goodies. The crew from Starbucks were so awesome and friendly. I had a good chat with their manager and she was saying how excited they are to be able to get out of the shop and do something in the community. 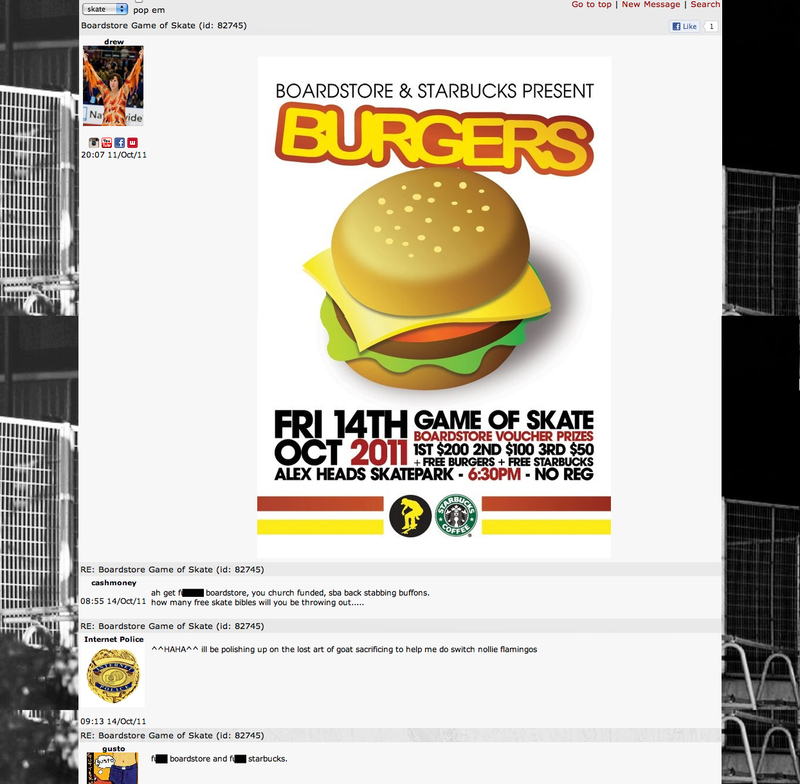 The comp was super laid back - no PA system, no registration, just rock up and play skate and maybe win $200. It was pretty cool hearing one guy in the middle of a game say "oi watch my coffee!" forget Red Bull, Boardstore comps are way more classy. Cheers to Desmond for the photos.